Understanding the environment is a key requirement for any autonomous robot operation. There is extensive research on mapping geometric structure and perceiving objects. However, the environment is also defined by the movement patterns in it. Information about human motion patterns can, e.g., lead to safer and socially more acceptable robot trajectories. 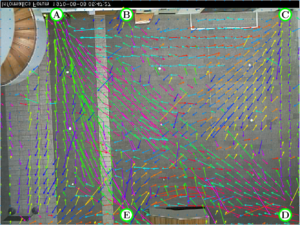 Airflow pattern information allow to plan energy efficient paths for flying robots and improve gas distribution mapping. However, modeling the motion of objects (e.g., people) and flow of continuous media (e.g., air) is a challenging task. We present a probabilistic approach for general flow mapping, which can readily handle both of these examples. Moreover, we present and compare two data imputation methods allowing to build dense maps from sparsely distributed measurements. The methods are evaluated using two different data sets: one with pedestrian data and one with wind measurements. Our results show that it is possible to accurately represent multimodal, turbulent flow using a set of Gaussian Mixture Models, and also to reconstruct a dense representation based on sparsely distributed locations.